3d Watershed Models with Printed Surface. Lime Green Boundary Denotes Edge of the Watershed. Model is Polyurethane foam with printed surface. 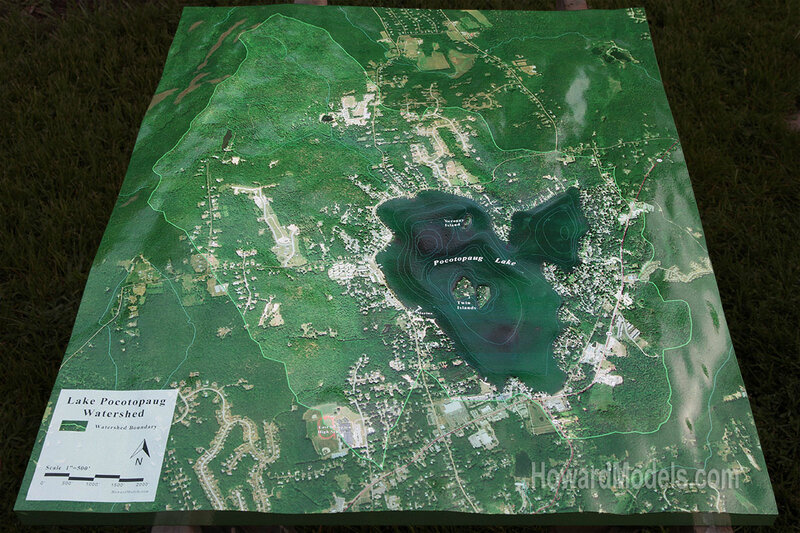 Watershed Model of Lake Pocotopaug with aerial orthorectified photography printed on the surface. The scale of this 30"x36" model is 1"=500'. Even at this scale, Due to our 1200 dpi printing process, you can see the cars in the parking lots. The watershed has 540' of relief. This model is used to communicate an understanding of the watershed to the public. 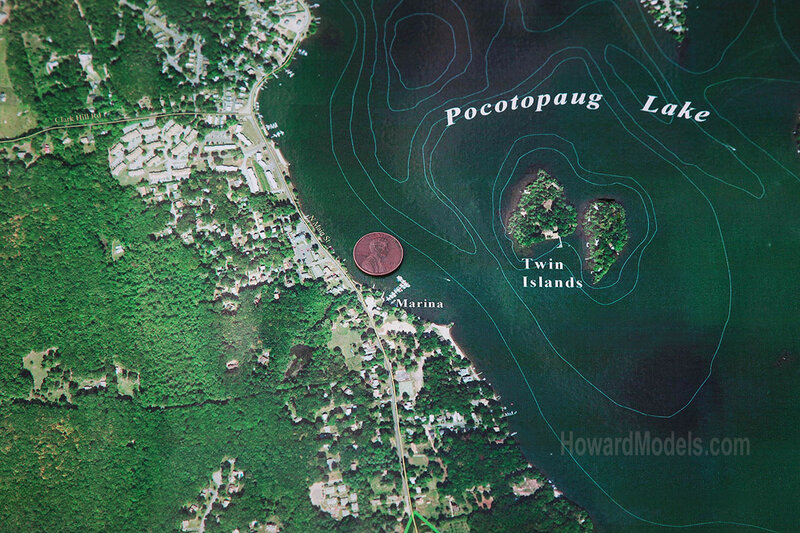 The Terrain was CNC milled with the relief of the lake bottom and contours were printed on the lakes surface to help communicate the volume of water in the lake. Printing the satellite imagery on the surface created an intreguing presentation on which residents can actually locate thier property and other recognisable features like the high school and retail areas. Our terrain models are milled from slabs of high density polyurethane foam. Our milling process accurately creates your terrain model from your paper or digital elevation model. Our models can be finished out and ready for final presentation, ready to drop your building into or supplied right off the machine for use as a study model or for your model shop to finish. Our models are precision cut from a solid piece of high density polyurethane foam. This model terrain was generated using the USGS NED 1/3 DEM (digital elevation model) data. Most of our printed watershed models are ready to ship in 3-4 week.